Tobacco smoke contains more than 4000 chemicals including nicotine (which is highly addictive), tar (which deposits in the lungs and contains carcinogens), carbon monoxide (which turns to haemoglobin in the blood thus preventing carriage of sufficient oxygen), and oxidant gases (which makes the blood more likely to clot and thus increases the risk of heart attack or stroke). Nicotine increases the heart rate, and causes a rise in noradrenaline and dopamine in the brain, which in turn creates a positive mood swing. When the nicotine effects began to wear off, this is accompanied by feelings of irritability and anxiety, and here is where the craving for another cigarette begins. Nicotine also causes dehydration of the skin, and can increase certain forms of high blood pressure. What effect does smoking have on your gums? Tobacco use is a strong risk factor for gum disease. Epidemiological data suggests that over 50% of advanced gum disease cases can be attributed to current or former smoking. There is a consistent, positive association between smoking and loss of periodontal attachment (where the teeth are attached to the gums and bone), even when adjusted for gingival inflammation and plaque accumulation. There are many components of smoke that exaggerate the inflammatory responses to periodontal pathogens, and others that suppress the immune response. Local effects of smoking include direct toxic effects on the flora. There are adverse effects of smoking on bone tissues resulting in reduced bone mineral density. Growing research also suggests second hand smoke can increase the risk for gum disease. It is not just having smoke in your mouth that affects the gums. Nicotine actually makes it easier for bacteria that is normally in your mouth to lead to inflammation. It also decreases the blood supply to teeth and gums, which masks the severity of the disease by reducing one of the obvious clinical signs i.e. bleeding on brushing that can alert a patient to gum infections. So if you are a smoker, your disease may remain silent. Tobacco makes gum disease more severe and more difficult to eradicate, and patients will often need a more aggressive approach. Treatment is less effective due to reduced collagen production and impaired healing. Even if your condition is stabilised, you are more at risk of it reoccurring than a non-smoker. Those with dental implants are at a greater risk. A periodontist will follow you closely and continually check for the formation of gum disease. Treatment is recommended at the earliest signs, as gum disease can develop rapidly. Smokers should schedule a check-up more frequently than twice a year. What if you give up? 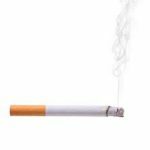 There is evidence that smoking cessation leads to a gradual improvement in periodontal status, and that while some benefits are immediate, in terms of risk factors, it can take 5 years to reach those of non-smokers . If you are interested in quitting you need will power, perseverance, and the help of family and friends. See the helpful link below for more details. And good luck!